Pohjois-Pohjanmaa tops the Christmas Potential Index of the Nordic Region. This region located in northern Finland has the best conditions for an efficient delivery of Christmas presents by Santa, contributing at a high level of Christmas-ness for kids and older kids. The region has very high scores in share of youth population, chance of snow and sourcing production materials. Pohjois-Pohjanmaa is closely followed by the capital region of Iceland and Suðurnes. 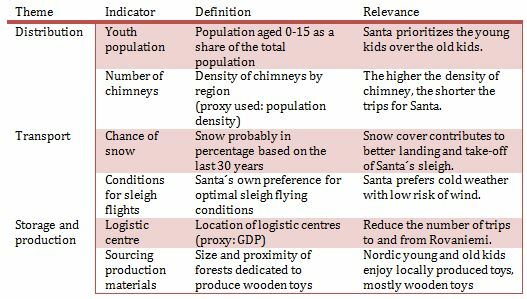 Both have high scores in share of youth population, number of chimneys and chance of snow, but have low scores in both conditions for sleigh flights (due to strong wind) and sourcing production materials (due to the absence of forests in Iceland). 1. The State of Denmark and the regions of southern Sweden should give the possibility to their residents to travel to other parts of the Nordic where the distribution of Christmas presents is easier for Santa. 2. The State of Iceland should plant more tress to insure more locally produced wooden toys to the population living in Iceland. Children in northern Finland, Iceland and northern Norway can expect an earlier Christmas presents delivery by Santa than children in other parts of the Nordic Region.